Subscribe to comments with RSS or TrackBack to 'Nationals/MLB Pitching Staff Year in Review; 2015'. (1) Whether or not Zimmermann felt disrespected by the Nats’ contract offer, he signed for basically the same deal when he was a true free agent instead of signing the extension that would have bought out his final arbitration year. He probably lost a bit of money (and the right to hit FA a year sooner) due to that decision. (2) I think you undervalue Gio (again); his season was largely the result of a combination of bad BABIP luck, some of which may have been fed by the Nats’ lousy defense which maximized the number of grounders that became hits. His numbers were very much in line with his non-2012 seasons – a solid #3 starter, good for 3 WAR a season at less than a 2 WAR price. (3) The Storen felt disrespected narrative we have argued to death. Whenever someone touts it they always somehow leave out the fact that (a) he was due for some regression in general; and (b) his flop started several games after the change. (4) The Roark alarmists don’t seem to recognize that he wasn’t just good in 2014; he was also excellent in 2013. The Roark apologists don’t ever acknowledge that his excellent 2013 was spent bouncing around from role to role just like 2015, and somehow he did just fine. We can agree that he is penciled in as the #5 starter, but will be keeping an eye on him. And a note on Carpenter as I continue reading: the Nats’ 40 man roster is full at the moment, the Oliver Perez signing took care of that. And likely took care of re-signing Matt Thornton, FWIW. The deal that Carpenter signed with Atlanta was a minor league deal, so he ended up in the minors anyway. I saw a metric on the bullpen as a whole that the Nationals had one of the worst records in MLB in games where they led after six innings. I can’t recall what the exact numbers/rankings were though. I also agree with most everything. 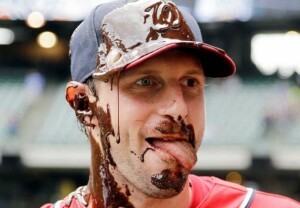 The bottom line on Scherzer is he was great when there was no pressure and lousy when there was pressure. Not exactly what you want for $30 million a year. Look at it this way. If you compare Roark 2014 to Scherzer 2015 what do you see. Not a lot of difference. Gio is your basic #5 starter who’s paid as a #5 starter. Good value. Zimmermann: rolled the dice, took a step back in 2015 and it probably cost him cash. Same with Desmond. I think both likely regret it (thought we don’t know what Zimmermann was offered). I dunno. In the end Zimmermann gets $100M+ guaranteed. I’m not sure i feel too too bad for him. Gio: Yeah i’m down on Gio. Just tired of the constant 3-4 walk outings. I’m sure its not a scientific analysis. I will say this: his whip jumped pretty drastically in 2015, from 1.197 to 1.423 year over year. Storen regression: he’s human. Any human put in his situation would have been excused if he did the same. Roark; kind of the same thing as Storen; he’s human. How would you feel if you did a fantastic, awesome job at your work one year and then your boss “layered” you and demoted you for your troubles? If the Nats needed 40-man room, its there for the taking. Erik Davis? Brian Goodwin? Even Taylor Hill at this point? All three probably slip through the waiver wire with no issues. You have to cut a little deeper if you want more space. But if you squint and really look at guys like Taylor Jordan, Rafael Martin and Tyler Moore, even these guys seem like they’re easily replaceable. Yeah, Gio’s WHIP jumped – but that’s pretty much entirely because his BABIP jumped from about .285 (+/-), where it had been his entire career, to .341. His walk rate (9.1%) was up slightly from 2014, but was actually lower than his rate in both 2012 and 2013. Even as his stuff has slowed a bit, he’s adjusted and maintained his K%. His batted ball profile didn’t change dramatically either – his GB% was up from 2014, but that’s because 2014 was down from his career norms. His hard contact was up 1.5% from his career averages, but his soft contact was up 1.1%. That’s not a lot to build a 50 point BABIP jump. Even when you factor in the Nationals’ lousy defense (21st in MLB in defensive efficiency) it still seems like Gio just had bad luck last year. And yeah, of course pitchers are human. It’s still hard to tie causation when their performance curve doesn’t match up with the narrative (Storen had his best week of the season, THEN went into the tank). I think Storen was overdue for regression anyway (he’s good, but he had been fabulous all season. I do think that it’s plausible that he was fine initially, but then when the inevitable struggles/regression happened his “demotion” may have gotten into his head a bit and kept him from riding it out. But we’ll never know. The “oh, wah, I got ‘demoted'” excuse bugs me, though – especially when the bullpen guys from teams like the Royals are noting in press conferences that they don’t care when they are called upon, it’s all about the team. Because THAT is the right attitude. And the team was clearly better with Papelbon pitching innings rather than Janssen, Treinan, Barrett (until he got hurt), Grace or Solis. Papelbon’s acquisition had very little to do with Storen. It was a referendum on the team’s inability to get out of the 7th and 8th innings, not the 9th. Well maybe the whole Royals story goes towards another narrative. The narrative that Williams was a god-awful manager, the clubhouse was poisoned and the players had long since given up being “team players” and were just in it for themselves. Wouldn’t surprise me if that was the case after reading the WP post-mortems and seeing first hand the joylessness of the team down the stretch. On Gio; lets say the Nats make the playoffs in 2015. Where do you want Gio starting? 4th? If Roark returns to his 2014 form and puts up a 5 win season, is Gio even starting in the playoffs? Babip is one thing, and blaming the defenders is another (thanks Matt for playing a plus-plus third baseman out of position all year); But you can also look at fangraphs batted ball stats and see troubling trends. LD% up. Hard hit% up. Whatever. Like I said; every time I saw him he was walking 3 guys in 5 innings. I somehow missed all the games where he “only” walked one guy. He’s frustrating to watch as a fan; I never watch him pitch and expect him to throw 6 shutout innings. I expect him to miss his target constantly, to always have guys on base, to always look rattled on the mound. I do NOT want him on the mound in a playoff series ever again. I guess that’s the definition of a 4th starter in this league. My brother for years had a similar in for Tyler Clippard. I could point out every stat in the world that indicated that he wasn’t just good in the bullpen, he was a weapon. All of which my brother replied by saying “every time I watch him, he [stinks].” We solved the problem by making him turn off the TV when Clippard came in. When we were at the game, he would leave our seats and go across the concourse and look out across South Capital. Weirdly, it worked pretty well! Fangraphs Meltdowns: 82, 7th in MLB. Fangraphs Shutdowns: 125, 21st in MLB. Only Oakland had more MDs with fewer SDs. For those unfamiliar: a Shutdown is any appearance by a reliever, where they accrue at least .06 WPA (win probability added). A Meltdown is the opposite – if they accrue -.06 WPA or worse, they earn a MD. In other words, if you increase your team’s chance of winning by at least 6%, you earn a shutdown; if you decrease it by the same, you earn a meltdown. Between SD / MD numbers and the -0.59 cumulative WPA our relievers earned this year, I think it’s fair to say they blew it when it mattered. Alright begrudgingly I will admit that I have been harsh on Gio’s 2015. which is good, because that means he’ll bounce back in 2016 and help pick up the slack vacated by Zimmermann. In theory anyway. An infield of Rendon, Espinosa, Turner and Zimmerman should be significantly better at turning ground balls and infield hits into outs than the primary infield of Escobar, Desmond, Rendon and Zimmerman we used in 2015. I couldn’t help myself so I looked up the changes in BABIP for all our returning starters from 14 to 15, so see if there was an overall trend. So, only Gio’s BABIP increased appreciably among the returning starters (dunno what to make of Roark’s change other than assuming that his pitching approach had to change going from 100 pitch starter to 20 pitch reliever). Scherzer’s should not have gone down like it did, unless Detroit’s infield was just that bad last year. And yet we’re looking at Daniel Murphy, another defensive black hole. I get how his LH bat would help, but it would be interesting to see how much the defense would improve with Espinosa and Turner up the middle. The range would be off the charts. I’m wondering about all these “rumors.” If its just Rizzo making a phone call to the agent to check in on the price, that’s one thing. But if its serious, then i have a seriuos problem. Murphy would cost the nats their 1st round pick (now sitting at 17 overall, or right about where they got Giolito). And in my opinion, he is not worth that pick. These rumors are definitely wilder than past years. Hard to know if there is any truth to them, although the Phillips one is getting reported enough now to think something is there. ESPN now saying that an agreement has been reached for him in return for ‘multiple’ minor leaguers. Sounds ominous, and no Pap, which I was hoping to see. I really hope they aren’t good minor leaguers, like no one in the top 6-7, but then again, I don’t really want Phillips at all so I am probably not going to like it unless we are dumping Pap. Well, they seem to have gotten beyond rumors for Brandon Phillips, who is owed $27M over the next two seasons while he goes from old to older. For as much contract as the Nats will be eating, they had better not be giving up anyone of consequence. I know they want a bridge to Turner, but this seems like an awfully expensive bridge. Escobar was owed A LOT less ($8M with buyout or 2/$14M) and had a much better year at the plate, although he would have been more of a defensive liability at 2B, where Phillips has four GG’s. Phillips isn’t a bad baseball player, so the deal doesn’t make the Nats “worse,” but it’s hard to see how it makes them demonstrably better. I’m thinking more along the lines of Difo, Austen Williams, that level of guy. There’s no way they should be trading a Giolito/Lopez/Fedde/Turner/Robles class of player for a 35-year-old middle infielder. I’m not crazy about picking up Phillips, although I do think he’s better than Espinosa. It all depends on the price. But if they can dump Papelbon as part of the deal things start to look a bit better. For the Reds it would be a salary dump (2 years/$27M vs. 1 year/$8M) and the opportunity to flip Papelbon at the deadline for something (a “Capps for Ramos” kind of deal). That would also get them out of having to pay Papelbon the $3M in deferred money. Just for fun while we wait for the details to come out: remember how upset many were that the Nats didn’t land Zobrist for 4years/$60M? Now, Zobrist is probably a better ballplayer – although Phillips had the better year last year by fWAR (2.6 Phillips, 2.1 Zobrist) and rWAR (3.5 Phillips, 1.2 Zobrist), Zobrist is more versatile in the field and at the plate. But Zobrist is actually one month older than Phillips, and Phillips is only a two year commitment for a $13.5M AAV vs. four years and a $15M AAV. True although the performance disparity flips and is much greater if you look at two and three year periods. And Zobrist adds the OF flexibility, which has value especially to Nats with Werth’s injury history. Not saying it makes up all of the difference but it goes a ways towards it. Robles is next line. Difo fits next, and then maybe our reigning PoY guy, Marmelojos. Not much else in the cupboard, unless this is where Goodwin and Skole go. So I’m hoping Turner and Robles are off limits for all but current, controllable stars, and while I don’t mind giving up Difo for something, I wouldn’t want it to be for Phillips. Any other position players are probably ok. I still don’t get the Phillips acquisition. He hits right handed (not what we need), plays an adequate but not spectacular 2B (in other words, a lesser player than Turner, Difo, Espinosa in that regard), hits an empty BA (kind of like Escobar who we just traded for some 5k/9 inning reliever), makes twice as much as Escobar. WTF? I agree with others here; if there’s ANY prospect going over of consequence i’m goign to be really pissed. Maybe if the Reds pay all of Phillip’s salary then we give them a good prospect, because that would mean we still have payroll flexibility to acquire what we actually need. Is this being done to placate Dusty f*cking Baker?? Is Philips and his .328 OBP (which is an improvement over 2013 and 2014) Dusty’s idea of a “speedy leadoff” guy we need? Hey, it would be better to have Phillips leading off than MAT! You know, teams can and have won the WS with only one LH hitter – most recently the 2006 Cardinals. The important thing is to get good baseball players. I’d rather have two years of Phillips than three or four more expensive years of Murphy (while punting a draft pick at the same time) – even though Murphy bats LH. For me the jury is still out on this trade. I’m still holding out hope that the Nats dumped Papelbon as part of the deal. They’ll have to move someone off of the 40 man roster if the deal goes through. The “speedy leadoff guy” is the one who’ll be starting in Syracuse thanks to a Phillips acquisition. Phillips is still an above-average defender, much better than Zobrist, Escobar, or Murphy on that score. Offensively, he looked DOA in 2014 but rebounded decently in ’15. Steamer sees him reverting to ’14 form, though. Scuttlebutt on Nats Prospects is Brian Goodwin, which would clear the 40-man spot. If it’s Goodwin and not much else, then it’s probably a decent trade, as I didn’t have much hope left for him. My reading of the tea leaves behind this acquisition is this: the team does NOT trust Trea Turner at all right now. More indictment of his call up and service time burn last season. If its Phillips for Goodwin straightup i’d be ecstatic. Lemme hop on twitter to see what “they” are saying. I just don’t think that Rizzo EVER trusts a young player to play real minutes and tries his hardest to throw a million contingencies at those situations. IMO, he should trust the good prospects he cultivates and let them play. Phillips’ splits aren’t bad. He actually was a bit better against RHP than LHP in ’15 and hit for more power. Career-wise, he is a bit better against LHP, but he’s still solid against RHP. It’s not the same as adding a LH bat, but he won’t be a liability against RHP. Todd – I think it means that they really don’t trust Danny, not Turner. I expect Turner is just a control thing, which I am fine with. Wally, I was already wondering whether the Nats would have Turner playing more SS or more 2B in the spring and at Syracuse. That will tell a lot. I “trust” Turner more than I do MAT. I’m trying convince myself that I trust Danny more at SS, because of the added defense, than I did at 2B, where hit up-and-down bat kept going up and down. We’ll see. A Phillips acquisition covers them for two years, assuming Turner would be available to step in for a struggling Danny at SS. I’ve got no problem with a Nick Lee or Goodwin level type of trade. That’s gravy as far as I’m concerned. What? Todd, my tea leaf reading (if I was into that sort of thing) would be that the team is trying to minimize the impact of Turner’s callup while giving him a chance to play every day so that he will be honed and ready when they do bring him up. And, of course, so they can guarantee the extra year of team control. I doubt that it’s that they don’t trust Turner. To me it’s far more likely that they don’t trust Espinosa to be a long term starter. FWIW (not much) I do think that Espinosa is the presumptive OD starter – but it’s a rebuttable presumption. If he faceplants in Viera and Turner wears it out, then Turner and Phillips (assuming the deal goes through) could easily be your OD starters. So if we acquire Philips, you have to think its Espinosa/Philips as opening day double-play combo. There’s just no way its Turner/Philips with Espinosa as super-sub again, not after he improves so much in 2015. So JohnC you’re right, if that’s the case then Turner is starting in AAA to get PT. Maybe that’s the plan all along, to get back the service time and only call him up if there’s an injury and he’s guaranteed to play full time. I’m ok with that. Of course, it also means… we’re still short a backup middle infielder. Difo? Is he ready to take that role? I don’t think so. Unless its purely as a “rest Brandon Philips” contingency because there’s no need to take out a plus defender like Espinosa or Rendon in late innings. So which version of hell do you want, the return of Uggla, or the overpay of Rollins or Drew? I’m sort of kidding about Uggla, who has probably played his last MLB game, but the other two remain clear and present dangers. The Nats have struggled for a long time to find adequate middle infielders for the bench (beyond Espinosa) and in the upper minors. Difo and Bostick are almost ready, but as noted, with Danny’s established inconsistency, Turner’s youth, and Phillips’ age, there’s probably going to be a desire for a more established safety net. 1) I’m more positively disposed to Brandon Phillips. And I am surprised about the degree of expectation of decline. He is an excellent athlete, and stole over 20 bases with a high percentage last year. And maintains good power. And plays a better 2B than Daniel Murphy. And ties up the budget for only two years. And hits right-handers just fine. And is a good clubhouse personality. And has been part of a Dusty Baker winner. It’s not like he had the 2015 of, say, Ian Desmond. 2) We also don’t know whether he is coming alone. I would not put it past Rizzo to take Phillips and Chapman and it would simplify the Reds task list. 3) I don’t see Rizzo as done. 4) I’m watching the Dodgers haul prospects and thinking that they have a lot to offer the Nats that should get a Strasburg deal done that we can be happy with. 5) I would be shocked if the Nats traded Taylor. He may not turn into a superstar, but someone besides me thinks he will. And I think he will. Given the uncertainty of Harper, the lack of sure thing (right now) outfield prospect above Robles, and Werth fading to the sunset, Taylor’s place on this roster is solid. His defense is among the top of his position in the game already. I think he’ll get there. 6) I’m also not so convinced that the trade means Turner starts the year in AAA. It’s a great insurance in case he fades, but the guy was ahead of the league in AAA. If he wins the SS job in the spring, Danny doesn’t like it, but Turner is a spectacular part of a future lineup, and the guy is a game changing player on a speed team. 7) I have not given up on the potential of other prospect starters, but I think that Giolito and his second elbow is now going to hit the fast track. I’m betting on him being in the regular rotation by mid-year if he dominates. It will be exciting to see the Nats turn him loose. I’m also not so sure the Nats would not trade Danny Espinosa. Everything we like about him is every reason other teams would like him. But do we have any reason to believe he has not peaked? To me, the mutterings of his being the starting SS have the familiar tone of being the Nats Minor League Player of the Year, or the guy invited to the AFL. He’s young and controllable in a league where that has greater value than ever. And he is not going to keep Turner on the bench for long, and then what? Like Souza, he is a player who may have value, but he does have a “Sell By” sticker. They are not the same player, but I have heard the Kelly Johnson chatter as a replacement for Espinosa. I haven’t heard much talk about trading Taylor or Espinosa. There’s a difference between not trusting them as starters and wanting to trade them. Frankly, the worrisome thing about Taylor’s approach at the plate is that it reminds me a lot of Danny circa ’11-’12. I would think that the Nats still have long-term hopes for Taylor as an OF starter, if not now, then in the post-Beard era. It would likely take a mega-opportunity, like the Souza trade presented, to trade him. On other points, there’s no doubt that the Dodgers have to be getting desperate for pitching, all the more so with their Iwakuma deal falling through. Perhaps they will spare us from Leake, who reportedly wants to be on the West Coast. I’ve always feared that Stras would end up with the Dodgers, but I’m not sure whether the Nats should be actively a part of making it happen. It’s not the talk. I would bet you, sight unseen, that the Nats are getting a lot of calls on Taylor, hoping they sell low. As for Danny, I’m sure Rizzo did not want to trade Souza, either. There are definitely teams that could use Danny E, a lot, and who like him. If the opportunity matches up right, it’s not about offloading him, but being open to trading him when value may be max. I doubt the Nats could get Turner and Ross for Souza now. Anyway, I am just introducing ideas to expand the scope of possibilities, not repeating chatter or intel. Nothing more. I think Ladson gets good intel. As for arming the Dodgers, the Dodgers are like the Red Sox. Blessed by limitless resources, frothing major media market or their own Gammons propagandist. Cursed by the karma of flushing endless monies down the toilet, just like Red Sox Nation. They didn’t win with Greinke. And the Nats didn’t win with Strasburg, either. Hey Forensicane – what’s your take on Marmelojos? Do you see a big league regular there? Kerzel saying the hold up on Phillips is what it costs the Reds to get him to waive no trade, which in turn affects what Nats give up. Like you, I’ve got my own prospect rankings. He’s #10 on mine, which I think is commensurate with a player who has that doubles power flame that threatens to flare int home run pop, in an organization that embodies a lack of power prospects. No, he does not walk enough, and it’s not like he’s Shawn Pleffner on defense. But it would be a damn shame to let him go at this level of value and see him turn around and hit 25 HR in 2016 somewhere else. So I know he is MLPOY, but I cannot see the team appraising him at peak value the way they may have (incorrectly) regarded Billy Burns and (correctly) assessed Souza. Orange (h/t Luke)isn’t exactly blocked by anyone, either. Rosenthal has the Nats “moving on” from Phillips. Wow. Hard to blame this one on Rizzo, though; it’s up to the trading team to get the player to waive the no-trade. I’m sure the Nats weren’t going to fork over more than the $27M overpay that Phillips is already due. Brandon, enjoy two more years in the cellar. Now what? I’m going to scream if they give up the draft pick to sign Kendrick, who is no improvement over Escobar. At least Murphy is a LHB, although he would still cost the draft pick. I would think they would be much better off with a bridge guy like Kelly Johnson than paying full freight for someone like Kendrick or Murphy . . . or Phillips. Johnson played for only $1.5M last season and put up quite respectable numbers. Or the Boras and D-back connections will lead them back to Stephen Drew. I am fine with Drew as a back up SS and 2B. If they see him as a starter, then that’s a problem. I don’t want to give up a pick, for almost anyone, but Kendrick is much better than Escobar. I am glad we are moving on from Phillips, although yet again, it was a public effor for a guy that has a questionable fit and we are almost lucky it didn’t work. Kind of makes you wonder what’s going on behind the scenes. I don’t get what the Nats are trying to do, or think they are trying to do. If they felt they needed a high-caliber bridge player at 2B, his name was Yunel Escobar. Escobar was due to make half what Phillips would have made, and what Murphy or Kendrick would make. The latter two will also be looking for at least five years, which would make no sense for the Nats. Besides, why block Turner? And is the lack of confidence in Turner, or in Espinosa? I understand the concern, particularly offensively, but frankly, I have greater offensive concern about Taylor and Ramos than I do about Trea and Danny. I would reiterate that what I think we are seeing is about having less confidence in Espinosa as an everyday long term option than Trea Turner. Otherwise, why go out and pay 27 million for a player who will be vestigial in 2-3 months when Turner steps into a full time role? The talk of Turner to the minors relating to the 2B initiatives is primarily initiated by pundits, not the Nats themselves. There are still plenty of players who would be good trade fits. Let’s just watch this play out. I don’t see Murphy being a fit, either, unless he takes three years or less. Given his poor defense, he clogs up the system for the life of his contract and pushes Espinosa out of town. By then, the middle infield talent on the farm will produce a starting caliber player. In my estimation, we will be very excited about the potential of at least one of these players by the end of next year, and they will be in or knocking at AA or above: Difo, Mejia, Schrock, Abreu. For what they would pay Murphy or Kendrick, the Nats are better off with Desmond on a shorter deal as his price tanks. That said, there is a much better option via a trade, but that kind of commitment will be a younger player and may push Difo out of town because he is so highly valued and high in the system. I think the solution is a bundle with Difo and Strasburg and other less luminous parts that brings back a big package that includes a long term controllable star option that bats left, or a shorter term option (Phillips-like) with many pieces for the minors. Rizzo’s creativity is fantastic, and I hope we see it on display because unlike the Braves, he has a lot to lose. But in these situations, his fearlessness helps the team and time is on the Nats side. Recall that Gott received a lot of interest on the trade front, not just from the Nats. As the Braves have discovered with Inciarte, trading for a widely valued commodity may open up doors to flip. The Dodgers seem to operate that way. With all of the righthanded talent in the Nats bullpen, including Treinen (pre-Mike Maddux), I would not be shocked in Gott continued to move in the right deal. Also, as far as the Phillips collapse goes, it was a dumb decision by Phillips. Which makes me wonder whether there is more to the story (Chapman negotiation?) in a more complicated deal that has to catch up to the rest of it, and we are hearing Rizzo stealth. Leaks are not the Nats thing, and Phillips would not have leaked this. I’ve already made the point of how the media rabble rouses first and then figures out its facts later. The DC media likes to beat on the Lerners are cheap trash, or Rizzo-Lerner trash and it is trash. They got a lot of mileage out of the Bud Black “scandal,” and Black got a free ride. Now he can enjoy life away from managing, with his ego intact, just like Jim Riggleman. I am all the way with the Nats brass on this. And let me say, as a longtime Expo fan, that to see the Nats spend what they have with no TV contract is something every national fan should be incredibly grateful for. The Nats could have overspent for many players, be they Dunn, Soriano, Zimmerman, Desmond, and even Fister. That they have not has enabled not only the Scherzer signing, which I believe will be remembered in 2016 as incredibly smart, but the investments to come this offseason. This is going to be a fun offseason and our patience will be rewarded. Just to clarify, the Espinosa out of town comment relates to how Danny-Boras will react to his being cemented out of the starting lineup. We’ve seen Storen; the situation will be exactly the same. Nothing hurts like failed expectations. That added middle infield starter had better be the right one, because it will spell the end of Danny Espinosa, who will then have to be traded before his value tanks when he starts the year with 30% strikeouts. And I love Espinosa in a utility role. But HE doesn’t. Bowden mentioned Profar, but I think Odor is a more realistic option. And the teams match up well. I like much of what you said, Forensicane, but Odor is in Rendon’s league, and I doubt that they would trade him straight up for Stras, given the years of control. I still like gardner for this team, and wonder if a Storen/Jordan package gets that done. I also wonder what ir would take to get Holt from Bos. Could make a nice platoon guy with Espy and cover some OF. I’m not talk 1:1. Talking about a package with Difo. can’t see the Nats trading platoon. This has never been a platoon style team. Roark is a sell low. I don’t see the Nats trading him and with Maddux, we can and should bet on a comeback. If anything, the under the radar trade candidate would be Ross, because of the hauls being brought in for young, controllable pitching (Giles and Miller) and the fact that the Nats are getting lots of calls on him. So now the rumor is Nats and Chen (whom I like, but wouldn’t give up a pick for him). Here is what I think: for the first time in recent memory, someone in the Nats FO is willing to leak things, so every time they have a discussion about someone, it’s hitting the papers. As opposed to being something that they are serious about. Since this is different from their MO of past years, it just seems confusing but my, in fact, be no different than what they’ve done before. Wally – another possibility is Boras trying to gin up interest and money for his client “don’t know if they would go to five years.” That’s not the kind of leak that would come from a ballclub, but an agent. I trust Rizzo’s strategy about this, whatever the case may be. Nooooooooo to giving up the draft pick for Chen, plus giving him in the neighborhood of 5/100. Neither of those things make sense for where the Nats are right now. Kazmir wouldn’t cost a draft pick, but why pay a premium for someone like him or Leake when the odd man out likely would be Roark, who is perhaps at least as good as any of those guys, maybe better? The Nats have a lot of areas of greater need where they could invest $100M.